Price listed is for two grams glass beads. 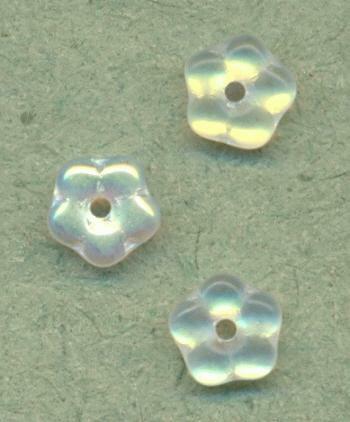 These are approximately 5mm transparent crystal ab lustered glass flowers. The package is marked ''Daisy Lochrosen'' made in the Czech Republic. They are double sided with a 1mm center hole so these could be used as beads or you could even add a tiny rhinestone to cover the hole. There should be about 28 beads in 2 grams.